We apologise for the late running of the following thought, and any inconvenience this may have caused you. It’s becoming increasingly clear that [the quality of] children’s and YA books do[es] not matter to those whose job it is to provide us with them. Somehow adult books are seen as mattering more. But as someone pointed out, somewhere, recently, if you don’t learn to engage in discerning reading at an early age, then you’ve not been prepared as a consumer for the all-important adult book market. If you’re an adult, then you will always have been a child first. How can you forget that? How can children’s books not have meaning? Dumb down at the beginning, and get ready to put up with the dumb adult books that will follow. I’m going to have to slow down, even more. Sorry. Don’t know where the RSI came from this time, but it’s getting worse, not better. Really short blog posts might have to be the solution. And now I’ll go and make some bread. And nail a stuffed elk’s head to the corner of our old kitchen sink. Because it’s typing I can’t do. Other work is fine. Unfortunately, or I’d be reading all day long. Ah, fathers! 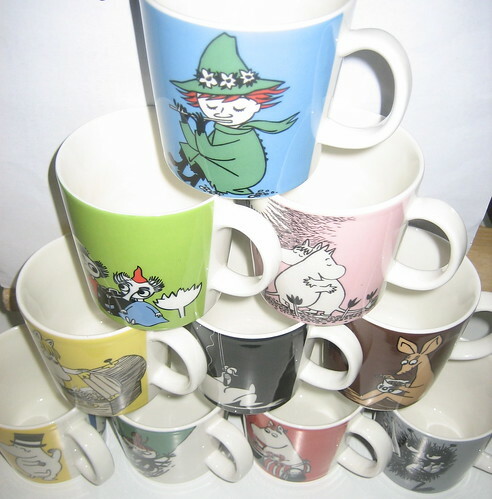 You’ve got to love them, don’t you? They’re so wise and gentle and handsome. 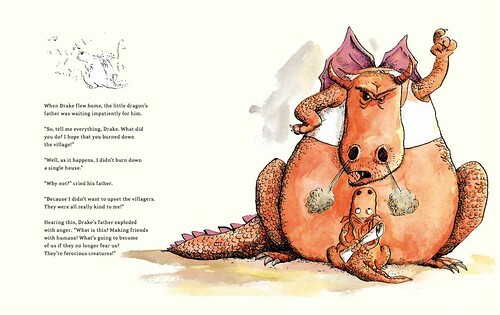 In Dragons – Father and Son, by Alexandre Lacroix, with beautifully fierce dragon drawings by Ronan Badel, and translated by Vanessa Miéville, we meet young Drake and his father, at home in their cave. The time has come for Drake to go out and burn down a few houses where the humans live. It’s tradition. Drake’s not keen, but he goes. But of course he doesn’t burn anything down; the humans are too canny. I mean, they are so kind that he just can’t. He learns a few things from the humans he encounters, though. Enough to placate his father when he gets home. It’s better to be admired for your good looks than how much you scare people. I’d like to think that in future Drake can continue just breathing fire on his intended meals (which seems awfully handy, as skills go). 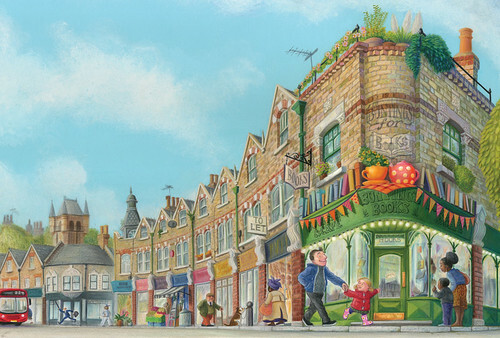 In Me and My Dad by Robin Shaw, we find a little girl going out for a walk past the local shops with her Dad. She likes everything about their walks, but the best always comes last. They see dinosaurs and crocodiles (this is a typical British town) and all kinds of magic creatures. But the best bit is at the end. And when you get to the end you realise why the little girl can see all these fantastic things en route. It’s because of what’s at the end. It’s teaching her to use her imagination. It’s a bookshop, with a café. She and her Dad choose a book, and sit down with a hot chocolate and read. They might even read about dragons. Humans like them. And if not, there’s always hot chocolate. Potentially another crocodile in the puddle on the way home. We both had the same idea, the bookshop owner and I. At a not terribly well attended event at his bookshop many years ago, the visiting author waved a copy of Harry Potter and the Philosopher’s Stone about. It was a hardback, and the visitor was – how shall I describe him? – a bit old-fashioned and naïve. I suspect he didn’t truly grasp how big J K Rowling was. To him, she and her book were merely part of his somewhat unusual topic, which was the many British authors who had been teachers at some point in their lives. That will be why two of us suddenly thought ‘what if that’s a first edition Harry Potter he’s got?’ We maneuvered ourselves into position to check, as discreetly as possible. But no, it wasn’t. Phew. Probably. One night recently when I wasn’t sleeping as soundly as I would have liked, I spent some time thinking about Harry Potter first editions. As you do. I have already mentioned that I know an author who appeared at the Edinburgh Book Festival alongside J K Rowling, and how the two new authors exchanged copies of their books with each other. It struck me that there must be other categories of people who’d have [had] a first in their possession. Other than the lucky book buyers who actually did what one is supposed to do with books, which is find them and buy them and read them. I’m guessing J K’s editor has one. Whether a publicist would hang on to a copy of a book they work on is less certain. And did she even have an agent? I think maybe not. Thomas Taylor, the illustrator of the cover design, probably? Then there are the reviewers. I wonder how many copies were sent out to them, back in 1997? Libraries. Did they buy copies, and when Harry Potter went crazy, did they do anything with those books? They could have been worn out by then, of course. Friends and family of the author? How many of the above first editions ended up at Oxfam? Our first two Harry Potter books were paperbacks, and I let them become Son’s (Daughter was too young at the time), but by book three I realised I’d need copies of my own, so quickly set about getting the first three books for me. 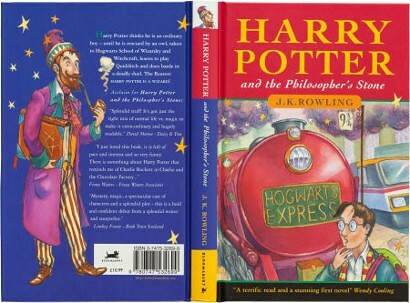 I have just looked up Harry Potter first editions, and discovered that my catch-up edition is somewhat more respectable than I knew. Takes a witch, I suppose. There is so much beautiful art in this book on History of Art for Children, that at first I didn’t see Mick Manning or Brita Granström in there, and they are the ones who made the book. I ought to be used to their style of educating children with the help of art and carefully researched facts, but still I saw only the classic art. And that’s perhaps as it should be. From cave paintings to Jean-Michel Basquiat, it’s all there. 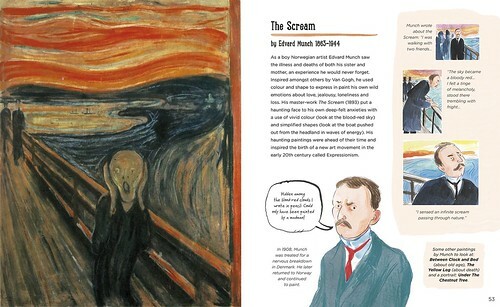 The adult reader will not be surprised to see all the classic paintings, and this is a fine way for children to learn. Each page has a work of art alongside information about the artist and then some of Brita’s drawings to show how the artist might have looked as he/she worked, and with individual comments that make each painting special. There is a glossary at the end, explaining the bare minimum of arty words. Enough, but not so it gets boring. Fantastic book and so beautiful to look at! If you come across the Resident IT Consultant’s red walking socks, just leave them where they are. I had already half decided they might need to be terminated, so forgotten and left behind is as good an end for them as any. Speaking of ends, he is nearing his [walking the length of Scotland]. One more instalment, which I’ve been told is going to be easier than this last one. So far 26 days of walking have brought the Resident IT Consultant from Berwick-upon-Tweed to somewhere near Kylesku. No doubt he’d tell you it’s not, but it’s the one placename ‘up there’ that I know, so that’s how I will describe it. Most of the time he has slept in comfort, either at home (instalments, remember) or in hotels or hostels. But this week the time had come for the bothy. Yeah, I know. At his age it feels a bit rough, not to mention uncomfortable. When I told Daughter back in the spring that bothies would have to be used, she made one of those young person style comments about old people, often ones related to them. And then she went and bought him a book about bothies as a birthday present. He even seemed to like it, and he is one of the hardest people to buy books for. There is now a second bothy book in the house as well. Where once I’m sure a book like that would have been thin and modest, with a few words for each bothy and all in black and white, they are now worryingly seductive. I mean, I would like to visit a bothy. If I didn’t have to walk there, and if they had beds and toilets. And as long as Val McDermid doesn’t go and kill anyone there. So I really shouldn’t look at these books. All I can think of is how I would furnish each bothy if it was mine. It’s good that these small cottages and other shelters which are no longer needed for their original uses, can enjoy a new lease of life hosting walkers and letting them hang their wet socks up, and forgetting them as they walk on.